Thanks for your company - and contributions - today. Join us again next Saturday for a full programme of festive fun and fixtures. There were are - another exciting weekend of Scottish Premiership football ends with Dundee United keeping the title race still alive, at least in theory. Their win at Tannadice prevents Celtic from extending the lead at the top beyond four points and it is United, along with Aberdeen, who head the chasing pack. "We weren't effective enough today. We had plenty of chances and gave away very stupid goals. "It is not just about individuals, it is about defending as a team. "We have not been effective enough in last three or four games. "We had energy, controlled the game and played quite well in the first half. "It is just about putting the ball in the net and that's the most important thing in football." Pete: "Shocking offside against Celtic. We need video refereeing." That would certainly help, as was shown with that controversy over whether St Mirren should have had a goal yesterday. Anonymous: "Bet Delia wished he had introduced Griffiths earlier, oh dear"
Anonymous: "Who cares Celtic got a goal disallowed. They got two goals at Pittodrie they shouldn't have." "I am delighted with effort and commitment. "They were absolutely knackered at the end, which is understandable when you are playing a team that can bring on the likes of a £3m striker in Scepovic and Griffiths, who knocked in 30 goals last year. "It was a bit nervous at the end when Griffiths got that goal. "You can see not just from his goal that, when Ciftci is on things properly, he is a handful. "I thought he was excellent along with everybody, especially after last week against Aberdeen, when we were disjointed." William McCafferty: "Big smiles in California at 6am from this ex-pat United fan at the game!" tom and 20 others: "Seriously, Griffiths is an exceptional talent. He deserves much more recognition than he gets from Deila." Many would agree with you there. Leigh Griffiths' late strike for Celtic was not enough to peg back the home side at Tannadice.Image caption: Leigh Griffiths' late strike for Celtic was not enough to peg back the home side at Tannadice. "As we have seen this season in Europe, Celtic's back four don't operate as a unit. I don't think Van Dijk helps anyone. Van Dijk plays for Van Dijk." That victory for United ensures that the Scottish Premiership title race has not become a procession - so far. With Inverness Caledonian Thistle having faltered in recent weeks, it is now United and Aberdeen who are mounting the challenge four points behind reigning champions Celtic. "United have created maybe four opportunities and take two of them. You have to give them huge credit for their defensive qualities and Celtic did not have nearly as many opportunities in the second half as they did in the first." Dundee United move into second place with that victory, ahead of Aberdeen on goal difference. That ends Celtic's run of 10 straight domestic victories, eight in the Scottish Premiership. United secure their first win over Celtic for two and a half years. Oh so close to an equaliser as Leigh Griffiths picks up the ball and cleverly makes room for himself before driving the ball low from 22 yards off the face of a post. Almost the end of 90 minutes. How much stoppage time do United have to survive? Can they do so or will Celtic deliver their traditional late goal? Poacher extraordinaire Leigh Griffiths pounces to drive the ball low under goalkeeper Radosław Cierzniak as the striker is found in space in front of the United goal by Kris Commons. Virgil van Dijk has been in excellent scoring form for Celtic in recent weeks, but the Dutch defender squanders a great chance with a casual header wide as he meets a Kris Commons free-kick aimed to the back post. So close to a third United goal as Chris Erskine heads on a corner aimed to the front post and Emilio Izaguirre chests the ball off the line at the far upright. Luck is not on Celtic's side again as Emilio Izaguirre chests the ball into the path of Stefan Scepovic. The Serb striker passes the ball into the net but is flagged offside. TV replays show that Blair Spittal was playing the Celtic substitute onside. Leigh Griffiths didn't take long to make his mark.... with a booking for a shove on United's Blair Spittal. Alasdair Mackenzie: So, @dundeeunitedfc beating @celticfc 2-0. whisper it, but maybe this might actually be a competitive #SPL season?" SPFL Premiership you mean ;-) I am sure most neutrals would agree with you. United switch off at a corner and John Rankin recovers to make a vital block as Nir Bitton is the man to make way for Leigh Griffiths. Talking of that man Leigh Griffiths, he is about to enter the fray as a substitute as Celtic manager Ronny Deila prepares for his last roll of the dice. A mix-up in the United defence almost leads to an own goal. Sean Dillon intercepts a through ball, but the defender's attempt at a pass back is poor and he is lucky to see it deflect off the shin of Radosław Cierzniak. The goalkeeper knew little about that. Kris Commons bursts into life but drills the ball straight at United goalkeeper Radosław Cierzniak. Celtic are still pushing forward, but they are looking a bit desperate now. tom and 20 others: "From a Hibs point of view, would like to see Griffiths remain pensive & brooding on the bench." No sign that the Celtic manager is going to turn to the former Hibs striker as yet. Your hopes of a loan return may be improving. "That will give Stuart Armstrong a massive boost as I think his confidence is down and he's not been playing as well as last season." Nadir Ciftci is the man of the moment for United. The striker shows great strength and worm his way past Emilio Izaguirre on the touchline and spots Stuart Armstrong at the back post. His lovely dinked cross finds the midfielder, whose header bounces off the body of goalkeeper Craig Gordon and into the net off the inside of the post. Celtic defender Virgil van Dijk rises to meet a corner and his downward header bounces off the turf and over the crossbar. Andrew Smith: "From an Aberdeen view, would like a draw between Celtic V Utd." It is a double change for Celtic, John Guidetti and Anthony Stokes being hauled off and Stefan Scepovic and Kris Commons are their replacements. Celtic are about to bring on forgotten man Kris Commons as they look for a bit more creativity. Anthony Stokes heads a couple of feet over the United crossbar from a wonderful whipped cross from Emilio Izaguirre. That's a bit more like reality. The stats for possession are now 33% for United. United almost strike on the break, but a fine sliding tackle from Emilio Izaguirre takes the ball away from Blair Spittal as the teenager appeared to be put clear in front of goal. So close for Celtic again as Anthony Stokes' cross deflects off Sean Dillon's head, loops over goalkeeper Radosław Cierzniak, strikes the face of the far post and James Forrest lashes a shot wide. Poor defending by Efe Ambrose - where have we heard that before in recent weeks? - as the Celtic defender is dispossessed by Nadir Ciftci and the Turkish striker forces goalkeeper Craig Gordon to bat the ball wide at the near post with a powerful drive. Celtic get the second half underway. Will the half-time team talks of Jackie McNamara and Ronny Deila make any difference. The United boss will be telling his side that they must give their defence some relief while Celtic will have been told to keep going and take their chances. Can United survive this Celtic onslaught? A fairer reflection of the balance of play, though, is the efforts on goal - nine for Celtic and three for United. Celtic's wastefulness is shown by the Glasgow side only finding the target with four of those, while United have forced forced a save with two of theirs and hit the net with the other. the official stats for possession show 52% for .... wait for it.... Dundee United! What is it they say about damn lies and statistics? Stuart Armstrong is high up the list of United players being linked with a January move to Celtic, but he has been part of a United midfield that has been virtually anonymous since he played a part in that opening goal. They have provided no out ball for their defence so busy have they been defending. Celtic captain Scott Brown receives the jeers of the United fans for a shot that ends up for a throw in - moments after the midfielder had rages at the referee for stopping the game to allow treatment for Sean Dillon. United defender Sean Dillon is down injured after another desperate block as Anthony Stokes attempted another pot at goal. "It is the time of year for the screening of the 'Great Escape' and that might be United's theme tune today." United somehow survive as the ball comes off the crossbar after goalkeeper Radosław Cierzniak punches the ball against Celtic's Nir Bitton and Virgil van Dijk's header is cleared off the line. Virgil Van Dijk has been linked with a number of top English clubs ahead of the January transfer window. Manager Ronny Deila is quoted in the papers as saying the Dutchman will be staying with Celtic - and he will be if he plays any more loose passes like the last one! James Forrest slices a shot wildly into the stand behind the United goal as an Emilio Izaguirre cross finds the winger steaming in at the back post. Strong claims for a penalty there by Celtic and they have a case. United defender Sean Dillon's shoulder knocks John Guidetti to the ground. To be fair to the referee, it doesn't look like the striker was going to collect the through ball. "You would have to say in the first 25 minutes, fortune has favoured Dundee United." Stefan Johansen fires against the near post, but the midfielder is pulled up by the linesman's flag. That was close and the Norwegian looked to be narrowly onside there, while John Guidetti was claiming for a pull inside the United penalty box in the lead up to that chance. Celtic goalkeeper Craig Gordon is at full stretch to palm away a powerful, 20-yard first-time effort from United full-back Conor Townsend. Celtic are certainly creating plenty of sights at goal and Anthony Stokes this time fires just wide of the far post after the Irish striker turns inside his marker. "Jackie McNamara will be happy with the score but not the defending considering the chances Celtic have had." Another celebrity in the crowd is United fan and TV presenter Lorraine Kelly and she looks happy at present.Image caption: Another celebrity in the crowd is United fan and TV presenter Lorraine Kelly and she looks happy at present. It is end-to-end stuff at Tannadice and United have an effort on target after some Celtic pressure. However, Jarosław Fojut's header is straight at goalkeeper Craig Gordon. Stefan Johansen has another chance to level, the Norwegian midfielder playing a one-two with John Guidetti, but the resulting shot gets stuck under United goalkeeper Radosław Cierzniak. Referee Steven McLean is giving Nadir Ciftci a talking to. The striker has to be careful having already been booked before his goal. It is James Forrest's turn to be wasteful for Celtic as he fires low into the arms of goalkeeper Radosław Cierzniak with a cross-come-shot. Stefan Johansen breaks clear behind the United defence, but the Celtic midfielder wastefully clips his effort over the crossbar without even forcing the goalkeeper into a save. "One thing you have to say is that United are far more up for this game than they were last week against Aberdeen." The Sunday newspapers were full of suggestions that Celtic manager Ronny Deila is eyeing January bids for some of today's opponents. Could be an added motivation for the likes of Stuart Armstrong and the Scotland Under-21 midfielder had a hand in that goal. Nadir Cifcti atones for his early yellow card. Stuart Armstrong's through ball is deflected off a Celtic defender into the Turkish striker's patch and he holds off Efe Ambrose before chipping the ball into the far corner of the net from 16 yards. Jonathan Sutherland: "Expecting an exciting game. Massive test for the Dundee United defence. Predicting 2-1 Celtic win." United kick-off at Tannadice and immediately Celtic's Scott Brown is tripped by Nadir Ciftci, with the home striker shown a yellow card after only 30 seconds! A few well-kent faces at Tannadice. Owen Coyle, once tipped to be Celtic manager and now at Houston Dynamo, and Scotland boss Gordon Strachan, who is a former Celtic manager.Image caption: A few well-kent faces at Tannadice. Owen Coyle, once tipped to be Celtic manager and now at Houston Dynamo, and Scotland boss Gordon Strachan, who is a former Celtic manager. The teams emerge from the tunnel and we're a few minutes away from kick-off at Tannadice. Dundee Utd: Cierzniak, Dillon, Morris, Fojut, Townsend, Butcher, Rankin, Spittal, Armstrong, Erskine, Ciftci. Subs: Wilson, Dow, Telfer, Szromnik, Spark, Coote, Adeyemo. Celtic: Gordon, Matthews, Ambrose, van Dijk, Izaguirre, Forrest, Biton, Brown, Johansen, Guidetti, Stokes. Subs: Scepovic, Commons, Zaluska, Griffiths, Wakaso, Fisher, Henderson. "It is maybe the first time we have been able to name the same team. "We have consistency in training, so we are improving. "It is an important game today. If we win, we are seven points ahead of the next team and it will show the others we are going to be difficult to play against this year. "We are improving and today we are going to get a test." "Between a bug and a few injuries and a suspension as well, we are a wee bit depleted. "Gary Mackay-Steven is in his bed ill.
"Everybody wants to make it competitive, but we understand the difficulty when you have five or six players missing. "But we will do our best to compete and, as a player, you want to play against the best players." Celtic manager Ronny Deila is clearly happy with his side's recent form and names the same starting XI that beat St Mirren last weekend. Dundee United go into the game without Paul Paton, who is serving the first match of his controversial ban for spitting at Aberdeen's Jonny Hayes despite his opponents saying the midfielder was innocent. Paton's place is taken by teenage Blair Spittal, while fellow youngsters John Souttar and Ryan Dow are dropped as manager Jackie McNamara goes with Callum Morris and Calum Butcher in defence. Dundee United are looking to avoid two straight home defeats - having lost 2-0 to Aberdeen last weekend. They will also be looking to avoid the 6-1 humiliation they suffered at Celtic Park in August, which was their third straight defeat at the hands of the Glasgow side. Celtic go into today's game seeking a ninth straight league win. Ronny Deila's side have only lost twice - in the Europa League to Salzburg and Dinamo Zagreb - since a surprise home loss to Hamilton 14 matches ago. Celtic were always expected to retain the title at a bit of a canter and the pack behind them seem to be conspiring to make it even easier for Ronny Deila's side by cutting each other's throats. With Inverness Caledonian Thistle losing for the second weekend in a row, it was Aberdeen's turn to jump into second by beating Kilmarnock, while Hamilton Academical's win over Ross County meant that Dundee United were pushed down to fifth ahead of today's game. Celtic have the chance to start putting a fair amount of daylight between themselves and the pack behind by going seven points clear of Aberdeen. Dundee United can draw level with the second-top Dons if they defeat the reigning champions. Welcome to today's coverage of this weekend's remaining Scottish Premiership game - and what a cracker we have in prospect. 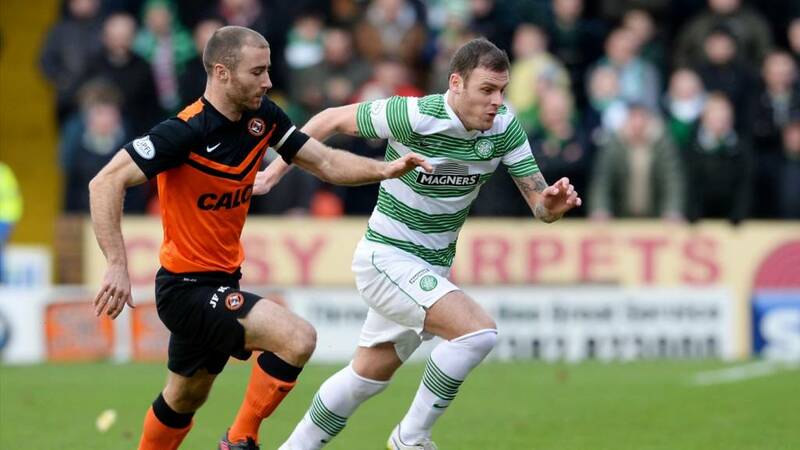 Leaders Celtic travel to Tannadice to take on a Dundee United side who have been riding high themselves this season.